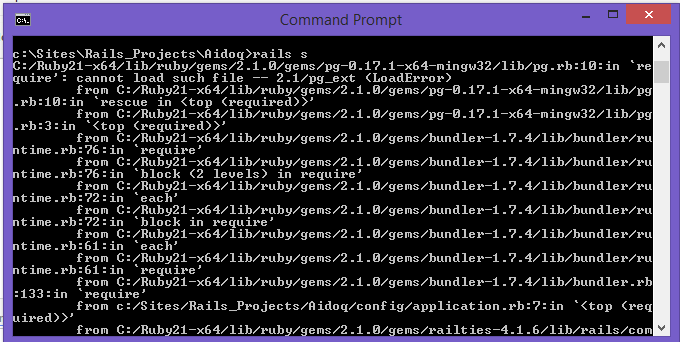 I recently updated to rails 4.1.6 and ruby 2.1.3p242. I also updated all gems on my system. After creating a new app, I keep getting a pg_ext load file error on running the server. I'm on windows 8 x64 with PostgreSQL 9.3. The pg gem was working fine under my previous RoR installation which was rails 3.2 and ruby 1.9.3. Posting the answer to help people facing similar problems in the future. Not the answer you're looking for? Browse other questions tagged ruby-on-rails-4 pg or ask your own question. How to install sqlite or postgresql on windows 8 for a ruby on rails setup?